Entering last night’s game, the first-place Mets had won five in a row. I’d say the Mets were “fresh off their fifth straight victory,” but nobody was fresh after Thursday’s five-hour-and-thirty-eight-minute, 16-inning affair. Except Sean Gilmartin. He was recalled from Las Vegas today to bolster a bullpen that had thrown 18 innings over the past three games. And Yoenis Cespedes, probably. Hitting five home runs in three games is a natural amphetamine — as discussed in the Joint Drug Agreement. Cespedes was suffering from the flu while he carried the Mets’ offense this week, so he took Friday off. MEANWHILE, Gilmartin never got into the game. J.T. Realmuto doubled off Josh Edgin to walk off in the bottom of the ninth. Marlins 3, Mets 2. No word on whether leavened bread products at Marlins Park would be replaced by matzoh. The Mets worked Edinson Volquez hard. They drew two walks in the third inning, sandwiched around a Jay Bruce single. Volquez went to 3-0 on Michael Conforto. Although the second offering to Conforto bounced in front of the plate, Terry Collins gave him the green light on the next pitch. Managers don’t give 3-0 green lights to just anyone, right? So you figure Collins was showing confidence in a guy who he’s jerked in and out of the lineup. On the other hand, 3-0 green lights aren’t the wisest strategic move when the opposing pitcher can’t find home plate. In any event, Conforto flied out to medium-depth center field on a 3-0 fastball down the middle. Curtis Granderson tagged and scored from third to tie the game at 1. Duda put the Mets on top in the fifth inning by bombing the shrubberies in straightaway center field, over 400 feet away. The Mets’ 21 home runs in 11 games leads the National League by a significant margin. The Marlins tied the game in the bottom of the fifth on three straight singles. The RBI hit was an excuse-me blooper by Dee Gordon, a BABIP anomaly. Syndergaard threw 87 pitches, striking out four Marlins, uncharacteristically few for a thunder god with a 100 mph fastball and a 93 mph slider. The likely reason is the same blister problem that affected Thor on Opening Day and cut shot his outing for the second time in three starts. Rafael Montero relieved Syndergaard for the seventh, despite having thrown 33 pitches in Thursday’s marathon. He promptly gave up a bloop single to no-hit shortstop Miguel Rojas. The Marlins sent up Giancarlo Stanton to pinch hit. Montero got Stanton to strike out on a 59-footer, but gave up a single and a stolen base to Dee Gordon. Montero was touching 96 in this appearance because he was overthrowing — velocity isn’t everything. He intentionally walked J.T. Realmuto to load the bases for Christian Yelich, who would face lefty Jerry Blevins with one out. Yelich sliced a hard line drive to left field. Conforto got himself in position and caught the ball running toward the infield. He took a bit of a windup but threw a perfect strike to Rene Rivera at home to nail the runner. Maybe — just maybe — this guy should play every day. In the end, the Mets were down to the dregs of the bullpen; they let Josh Edgin throw 36 pitches in the eighth and ninth. 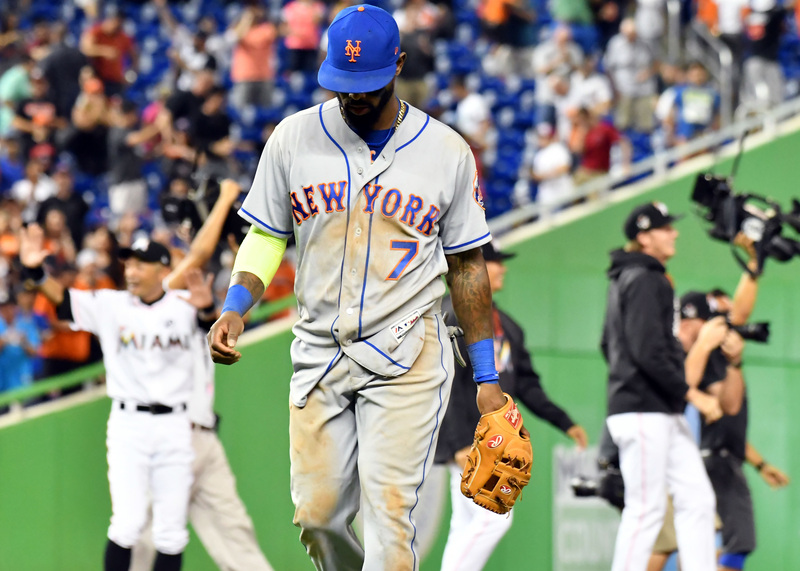 The lack of high-quality relievers for high-leverage innings bit the Mets before it could bite the Marlins. Edgin walked Miguel Rojas (career .288 OBP) to lead off the ninth inning. Miami tried to re-gift the walk when rookie J.T. Riddle couldn’t get a bunt down. Edgin even got Dee Gordon to pop up to left for the second out. With Fernando Salas being held back for the save situation that never came, the tired lefty pitched to on-fire righty J.T. Realmuto, who promptly drove the ball into the right field gap. By the time Bruce reached it, Rojas was around third and scoring the winning run. Volquez always wearing the bill of his cap like a frying pan. Very flat. Never liked that look. — Keith. I cannot wait to try the toasted grasshoppers. You? … I’m gonna pass. — Gary, Keith. The Mets could use more than six innings out of Jacob deGrom tonight, in the third game of the Marlins series.